Burlington, NJ April 21, 2014 – Infraspection Institute announced today that it has added Infrared Inspections for Weatherization Professionals to its Distance Learning program. 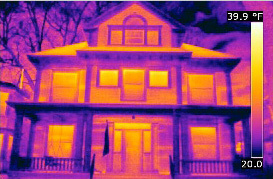 Originally offered exclusively as an open enrollment course, the online version is a 14 hour theory and application course for the use of thermal imaging as a diagnostic tool for use in the weatherization of building envelopes. Designed to get students up and running quickly, the course covers infrared theory, heat transfer concepts, equipment operation and selection, using a thermal imager in conjunction with a blower door, standards compliance, image analysis, tools for confirming infrared data, and report generation. Students are trained to identify and document thermal patterns caused by improper design, workmanship or material failure. Self directed learning activities are provided to help student gain practical experience; however, one need not have a camera to successfully complete the course. Course tuition includes 24 hour access to all online course presentations, Student Reference Manual, online quizzes, proof of course completion, and free ground shipping of course materials to continental US. Infrared Inspections for Weatherization Professionals is one of several online courses available from Infraspection Institute. For more information on Infraspection Institute’s Distance Learning program or open enrollment classes, call 609-239-4788 or visit Infraspection.com.